Learning to appreciate indirect evidence is a good thing, because how we evaluate and piece together fragments can lead to astounding genealogical revelations. What keeps the field of genealogy so interesting, at least for me, are the complex puzzles. Whether it’s identifying a person, a relationship, or an event in someone’s life; a genealogist usually serves to bring closure and clarity to these entangled webs of records and evidence. Perhaps in this case, I am not quite untangled yet, but I find it extremely beneficial to document my research process and assess the evidence and it’s ability to support my hypothesis. Research on this family, past and present, has supported a hypothesis that the wife of Elisha Freeman is Lucy Bartlett, born 18 Nov 1750 in Windsor, Connecticut to Gershom and Margaret (Darte) Bartlett. Elisha was born three years before, 10 July 1747, in Mansfield, Tolland, Connecticut to Sylvanus and Mary (Dunham) Freeman. Elisha Freeman and Lucy Bartlett were married on 2 Nov 1775 in Hanover, New Hampshire. Sylvanus received a land grant as a proprietor of Hanover, which lay 175 miles north from Mansfield and later deeded the tract to Elisha as a young adult. The realties of frontier life at this time were harsh. A decade before, future father-in-law Gershom Bartlett served in the Connecticut militia during the French-Indian War, an event that cast anxiety over colonists regarding settlement in what was still considered Indian country. Settlement of Hanover and adjacent townships did not begin until six years after they were originally chartered. But with consent, a band of adventurous men from the rolling pastures of Connecticut including Elisha went up in the winter to fell the first trees and begin work on the new township. Gershom reportedly moved to Windsor for a brief time, near the time when his father Samuel died in 1746, but was back in Bolton by 1751. The birth of Gershom and Margaret’s daughter Lucy 18 Nov 1750, was recorded in the town of Windsor only. The quaint town of Bolton proved to be a haven for artisans in the 18th century because of the rich deposits of schist and mineral rock used for carving stones. Gershom married Margaret Darte, daughter of Daniel and Jemima (Shayler) Darte in Bolton on 1748. The couple had twelve children in both Bolton and Windsor. One would think Gershom was content in the artisan haven of Bolton, but in 1772, Gershom for unknown reasons, bought an inexpensive tract of land along the Ompomponoosock River in Norwich, Vermont. His wife Margaret died in Norwich on 20 Sep 1778; he then second married Hannah Burton, 24 May 1780. Some historians and researchers believe he came back to Bolton and died there, but records of his death and gravestone indicate he died 23 Dec 1798 at his late homestead in Norwich. His estate was administered by the Hartford District Probate Court in Windsor County, Vermont in 1799. Vital records recorded Elisha Freeman married Lucy Bartlett, 2 May 1775 in Hanover, New Hampshire. The original reference is located in the vital records filed by the town clerk in Hanover, New Hampshire, but was first located in the New Hampshire Vital Records Index. No references to the marriage have been found in church records. Hanover was a sparsely populated town in 1775 and there was certainly only one Elisha Freeman living in the town at that time. On 5 Mar 1776, Gershom Bartlett sold land to Elisha Freeman in Norwich, Windsor County Vermont, then Gloucester County, New York. Town records do not show when Elisha was admitted to Norwich, but the fact that he bought land from his father-in-law almost a year after his marriage correlates with the timeline. Elisha does not appear in town or proprietor records after the marriage. A family manuscript titled, “Freeman-Hedges, Vermont” was reprinted in The American Genealogist and names the children of Elisha Freeman, wife unnamed. One of the children is Gershom B[artlett] Freeman, born 14 May 1778 in Norwich, Vermont. On 29 Oct 1799, Probate Court ruled in the administration of Gershom Bartlett’s estate that creditor Elisha Freeman was owed 9 dollars and 34 cents by book. Elisha appears later in the court rulings as having not furnished a voucher of payment for his portion of the estate. Many sources document Elisha as living in Norwich through his appointments to town offices and military service. In 1802, he sold land to Abijah Wheeler of Norwich and according to the deed, stated he lived in nearby Stratford, Orange County, Vermont. He is found in Norwich in the 1810 and 1820 census. He did not however file for a Revolutionary War Pension. The only records identifying Lucy Bartlett are the birth record and marriage to Elisha. She is not buried with Elisha in Westville, New York. Elisha left Norwich as an old man with his son David Freeman and his family in the early 1830s. According to the tombstone, Elisha died 8 Jul 1836, aged 90 years and is buried next to his son David Freeman and wife Lavinia Waterman. She is not named in the documents that suggest relationship between Gershom Bartlett and Elisha Freeman. She is not named alongside in any of Elisha’s records, minus the marriage in 1775. Vital Records of the children do not identify Lucy’s last name. The entry of the marriage made in Hanover, New Hampshire’s town records does not mention either groom or bride’s parents. Several visits to NEHGS have furnished these clues, including an astounding collection on the Freeman family, authored by Willis A. Freeman. In his collection of manuscripts was a genealogical sketch of Elisha, that suggested he married possibly Lucy Baxter, but his reasoning is not cited or deducted from any genealogical sources and the entry is written with a cautionary question mark [?]. Research has not found any possible match for a woman named Lucy Baxter that married Elisha Freeman. Another local historian and genealogist, Gilman Dubois Frost, who studied in great depth the families of Hanover, had trouble drawing a conclusion on Lucy’s identity. Frost thinks Lucy Bartlett may have been the sister of Nathaniel Bartlett, who married Susanna Clark of Canaan, and the aunt of Nathaniel Bartlett, who married Lucy Bridgman in 1806. Clues about what happened to Lucy can be gleaned from evidence in the US Census. She could have died between 1820 and 1830 based on the schedule of Elisha’s household in the US Census. Elisha is head of household in the 1820 Census, living next to his son David Freeman. In the household schedule, there is one woman over 45 years old and would most likely be Lucy. In the 1830 Census, Elisha does not appear on the schedule. In son David’s household schedule for the 1830 Census, an elderly man is living in the house, which would have to be the Elisha, at this time about 83 years old. David is the only of Elisha’s siblings left in Norwich; the other siblings had already sought other prospects and moved to upstate New York. This post serves as an exercise in how to evaluate and present evidence. With no source directly stating that Lucy Bartlett who married Elisha Freeman is also the daughter of Gershom, indirect evidence supports this hypothesis and demonstrates a relationship between the two families. The little bits and pieces discovered along the way in research really help to tell the story. Lorraine Cook White, The Barbour Collection of Connecticut Vital Records, (Baltimore, MD: Genealogical Publishing Company, 2004), Vol. – Town of Windsor, 30. Birth Record of Elisha Freeman, 10 Aug 1747, Vital Records, Mansfield, Tolland, Connecticut, 138. Hanover Town Records, Birth, Marriages and Death, (Genealogical Society of Utah: Salt Lake, 1950), 36: accessed on Family Search, New Hampshire, Town Clerk, Vital and Town Records, 1636-1947. Hereafter cited as Entry of Marriage for Elisha Freeman and Lucy Bartlett, Hanover Town Records. Sylvanus Freeman quitclaimed the 45th plot in the township of Hanover, New Hampshire to son Elisha on 10 May 1769. See Registry of Deeds, Rockingham County. Deed from Silvanus Freeman to Elisha freeman, 23 May 1769, 100:425; accessed on Microfilm at NEHGS. On 17 Dec 1767, Elisha received six shillings for two days of highway work. See Hanover Town Records, Proprietor Records, (Genealogical Society of Utah: Salt Lake, 1950), 57. He appears several times in the town records of Hanover for payments and appointments in town administration. See Ibid, 106, 108-109; Ancestry.com. The records of the town of Hanover, New Hampshire, 1761-1818 : the records of town meetings and of the selectmen, comprising al [database on-line]. Provo, UT: Ancestry.com Operations Inc, 2005, 13, 16-17. Hans Depold, “The Bolton Art Colony & Gershom Bartlett,” Bolton Horizons (Bolton, CT: June 2010; Revised Jan 2015): accessed on http://www.boltoncthistory.org/boltonartcolony.html. Hereafter cited as Depold, “The Bolton Art Colony & Gershom Bartlett”. “Vital Records of Bolton to 1854 and Vernon to 1852,” (Hartford, Conn: Connecticut Historical Society, 1909), 21: accessed at https://archive.org/details/cu31924028842057. Massachusetts Vital Records to 1850, Town of Northampton (Vol.1), 254. Accessed on AmericanAncestors.org. Depold, “The Bolton Art Colony & Gershom Bartlett”. “The Art of Life and Death in Colonial Bolton”. Samuel died 19 Nov 1746 in Bolton, Connecticut. See Vital Records of Bolton to 1854 and Vernon to 1852,” (Hartford, Conn: Connecticut Historical Society, 1909), 64. Hans Depold states Gershom was involved in land speculation while living in Vermont. See Depold, “The Bolton Art Colony & Gershom Bartlett”. Data Entry and Photo for Gravestone of Margaret (Darte) Bartlett, Waterman Hill Cemetery, Norwich, Vermont: Findagrave.com, Memorial no. 51570726. Norwich, Town and Vital Records, Vol.1, 1761-1793, 255. Index card for Gersham Bartlet, 23 Dec 1798, Norwich, Vermont: accessed on Familysearch, “Vermont, Vital Records, 1760-1954”; Data Entry and Photo for Gravestone of Gershom Bartlett, Waterman Hill Cemetery, Norwich, Vermont: Findagrave.com, Memorial no. 43393024. Administration of Gershom Bartlett’s Estate, Apr 1799, Probate Records for Windsor County, Vermont, Hartford District, 1783-1851, (Genealogical Society of Utah: Salt Lake City, 1982), on microfilm at NEHGS. Hanover Town Records, Birth, Marriages and Death, (Genealogical Society of Utah: Salt Lake, 1950), 36: accessed on Family Search, New Hampshire, Town Clerk, Vital and Town Records, 1636-1947; Town of Hanover, New Hampshire, Marriage of Lucy Bartlett and Elisha Freeman, 2 May 1775: accessed on Ancestry.com, New Hampshire Vital Records Index. Gershom Bartlett to Elisha Freeman, 5 Mar 1776, Norwich, Vermont land records, 1:27, recorded 14 May 1787: photocopied at Town Clerk’s Office. Donald Lines Jacobus, “Freeman-Hedges, Vermont,” The American Genealogist, Vol. 10 (1933), 127. Norwich, Town and Vital Records, Vol.1, 1761-1793 (State of VT: Filmed by the Genealogical Society, Salt Lake at Norwich, 31 July 1952): accessed on Familysearch; Elisha Freeman, compiled Military Service Record, (Corporal, Peter Olcott’s Regiment, Vermont Militia), in Compiled Service Records of Soldiers Who Served in the American Army During the Revolutionary War, Microfilm M881, Roll no. 896. Transcriptions of the tombstone for Elisha Freeman, Franklin County, New York: accessed on Northern New York Tombstone Transcription Project; D.A.R. New York State Series. Graves of Revolutionary Soldiers buried in New York, Vol vi, part 1, page 48; cited in George Willis Freeman, “Freeman Collection [manuscript],” call no. SG FRE 55 . George Willis Freeman, Freeman Collection. Gilman Dubois Frost, Microfilm Edition of Dr. Gilman Frost’s Genealogical Records of Hanover, New Hampshire, (Hanover, New Hampshire: Dartmouth College Library, 1972). Elisha Freeman, 1820 US Census, Norwich, Vermont, Roll 128, page 349, image 216: accessed on Ancestry.com. The language of maritime documents may be unfamiliar to some genealogists. I have made available at my blog a glossary of maritime terms. This glossary came from an unpublished finding aid at the National Archives at Boston. You can download the PDF file HERE. Many of our ancestors have amassed a great deal of documentation, with folders stuffed to the brim. Such is the case of the founder of Sandwich, Massachusetts, Edmund Freeman. I have some blog pieces from past about him and his life still begs curiosity. While I have read many genealogies and scholar’s articles on the Freeman family, it is important to understand what sources are authoritative and worth citing. Most would say Robert Charles Anderson’s Great Migration is a good place to find a colonial ancestor’s genealogical bibliography, as in what scholars and historians have already looked in to the questions we have today. Compared to Anderson’s list of sources, I have Edmond Freeman’s citations from Plymouth Colony Records, “Prence Freeman of East Hampton, Connecticut” from The American Genealogist and Mary Walton-Ferris’ Dawes-Gates and Allied Families Genealogy. My grandmother had left behind photocopies from library books which I identified as including George Norbury Mackenzie’s Colonial Families of The United States and John Camden Hotten, Original Lists of Persons of Quality. I was glad I took a few minutes to look up these sources. As I catalog all of these research papers, I realize I have never taken the time to really peruse them and organize the details. Creating a chronology would point out discrepancies, if any and could lead to a published revision of Edmund Freeman’s genealogical account. More realistic would be an article that “magnifies” the events in his life to have more historical context. Has anyone ever undertaking the project of revising an ancestor’s previously published genealogy? My day at NERGC went very well. My three lectures gave me some clever research tips and inspiration to continue researching. Fig 1. Andrew Boisvert taking the audience on a virtual tour of Old Colony Historical Society which focuses on Taunton, Mass. The exposure to the genealogy world was great; I met and connected with many people. Every one at the booths were very pleasant and (fingers crossed) could find some opportunities soon. I want to thank Marian Pierre-Louis for helping me feel welcome and able to enjoy the conference. Conferences are something I would like to continue to go to in the future. Now I’d like to share the blogs and websites of people I met during the conference. 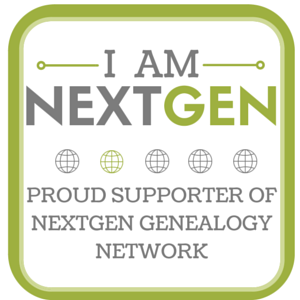 I’m also now a member of MSOG and NEHGS and am looking forward to meeting fellow genealogists. The genealogy world is certainly for me at least, full of fun and excitement.